After losing to UFC middleweight king Anderson Silva in the most hyped rematch in mixed martial arts history, Chael Sonnen (Pictured) claimed he was contemplating a move to the light heavyweight division. On this week’s edition of FUEL TV’s UFC Tonight, Chael P. announced he’ll make his return to the 205-pound class against Forrest Griffin on New Year’s Eve weekend. Sonnen has competed at middleweight for most of his controversial 15-year career. The last time the 35-year-old dabbled in the light heavyweight pond was in his Octagon debut, which resulted in a loss to Renato “Babalu” Sobral at UFC 55. 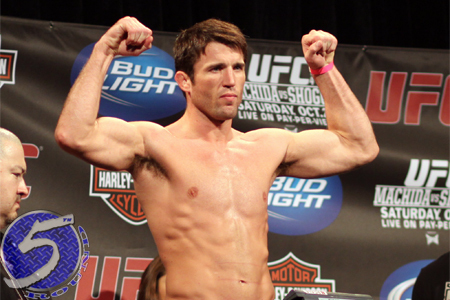 Uncle Chael has fought exclusively in the middleweight class since the October 2005 defeat. Although he came up short against Silva at UFC 117 and again at UFC 148, Sonnen is the only fighter who has made “The Spider” look human in the past six years. Griffin, meanwhile, posted a unanimous decision victory over Tito Ortiz in July and has won three of his last four contests. Nonetheless, he was less than spectacular in retiring “The Huntington Beach Bad Boy” and UFC president Dana White has encouraged him to retire. Following his tango with Ortiz, it was revealed Griffin was prescribed Testosterone Replacement Therapy for the fight. Sonnen has been a longtime user of the controversial treatment. This scrap marks the first time in UFC history where two known TRT athletes will square off. Griffin submitted Sonnen nine years ago in a IFC contest. They will collide again December 29th in Las Vegas, Nevada. Either MGM Grand Garden Arena or Mandalay Bay Events Center will serve as host.